Emphasis on love. One of the first posts I wrote for this blog included this response from Stephen Mitchell to the question “What is the Gospel According to Jesus?”: “Simply this: that the love we all long for in our innermost heart is already present, beyond longing.” I mention this now because for some time I’ve been meaning to write a post about my experience of God, and I have to say that all I have ever known about God has always been love. Emphasis on know. You see, the God that I know, the God that Mitchell’s quote points to, is the only God that I have ever experienced in my life. Sure, I’ve been told lots of things about God, from people who think that God can be found in the “common storyline, common theme, and common message” of the Christian Scriptures. That God is what I like to call the “Bad Dad” God, the God who acts like a petty tyrant lording over his household, whose every action (no matter how indefensible) is an expression of his perfect will and must not be questioned, and who enforces submission to that will through violence. Oh, and he loves you, too. How do you know? Because “the Bible tells you so,” so you’ll just have to believe that it’s true. So when I read the Christian Scriptures, I can’t help but understand them based on what has been my experience of the holy and the divine. And when I look at the teachings of Jesus, it’s pretty clear to me that he, too, experienced the holy and divine in a similar way. That experience is what informs the most beautiful and compassionate parts of his teachings. All the other stuff attributed to Jesus just sounds too much like the same old Bad Dad story to be the authentic teachings of a truly enlightened being. Does this sound naive? “I’m telling you, once and for all, that unless you return to square one and start over like children, you’re not even going to get a look at the kingdom, let alone get in.” Jesus said that, too. I figure that if Comfortism has a high holy day, this is it: the day the King went to meet the King. I’m talking about the anniversary of the death of Elvis, the human being who was closest to God (due to his diet of peanut butter and banana sandwiches). So plan on celebrating with a Comfortist communion of a couple of PB&B sandwiches washed down with a PB&B smoothie. And don’t forget to keep our “Ray of Light” and our “Prophet of Comfort” in your thoughts and prayers. 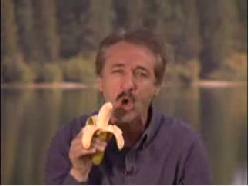 Without the zany teachings of Ray Comfort, we’d have no religion, my brothers and sisters. Just giving credit where credit is due.